All the Marines gathered in the center of the dance floor. Singing their hearts out to Toby Keith’s Courtesy of the Red, White, and Blue. It was such a cool moment to see these marines proud to be in service to our country. You see, Robb serves in the Marines. One of the coolest things was his wedding band which was made out of 1902 Springfield rifle stock from the world wars! So neat right?! Kaylee and Robb met for years ago at a friend’s wedding! Kaylee works in the heart of Africa at the Columbus Zoo and Aquarium! So, when it came time to select a wedding venue, no other venue seemed right but the zoo! Their wedding day was SO much fun! The wedding venue overlooked the African safari. Zebras, antelope, ostriches, and giraffes filled the landscape. And that was only the beginning! 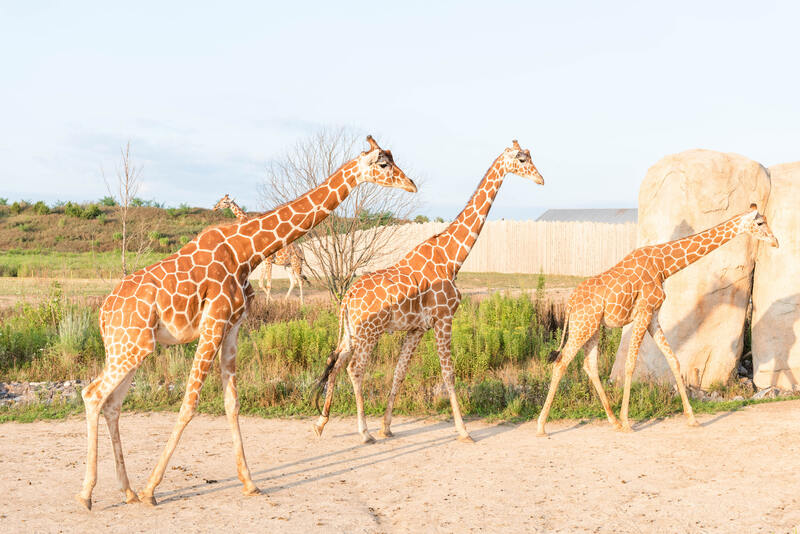 The wedding guests were able to feed the giraffes right during cocktail hour! We also had a baby cheetah, penguin, and python snake visit us! It was SO much fun! Sunset photos were absolutely magical with the giraffes in the background! It doesn’t get much cooler than this. What an amazing wedding combining Kaylee’s love for animals and Robbs military service. Congratulations to Kaylee and Robb on your marriage! Thank you to Jessica Abbey Photography for allowing me to second shoot for this amazing couple’s day!